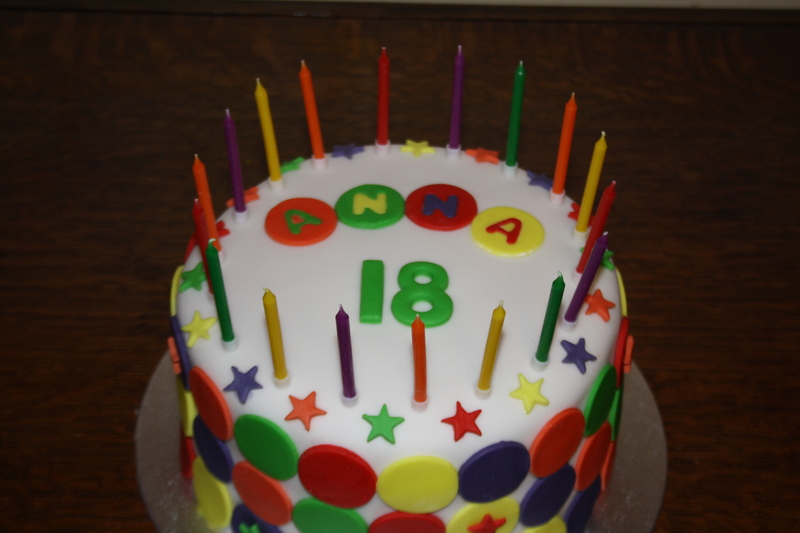 A couple of weeks ago, it was our youngest sister Anna’s 18th birthday (HOW is she 18?!). 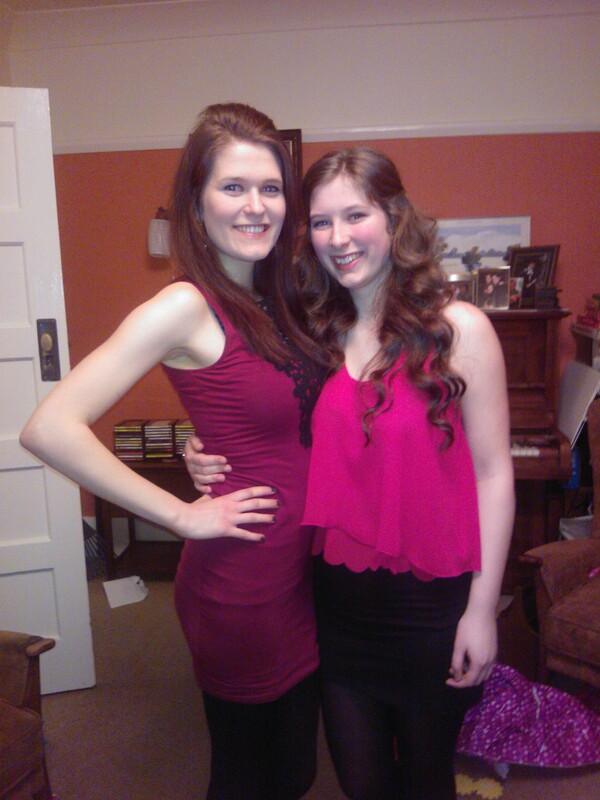 Look at my two sisters, all ready for Anna’s first ‘legal’ night out – making me feel ancient!! It goes without saying, that this called for a special cake. Expectations were high, so Lizzy and I started the planning weeks/months in advance. Anna loves bright colours; definitely no pink, fluffy stuff or bling. The rainbow cake seemed an obvious choice, but we were concerned it wouldn’t be ‘surprising’ enough, especially as I’d already made this one for Lizzy’s birthday, and this one for my daughter’s 1st birthday. 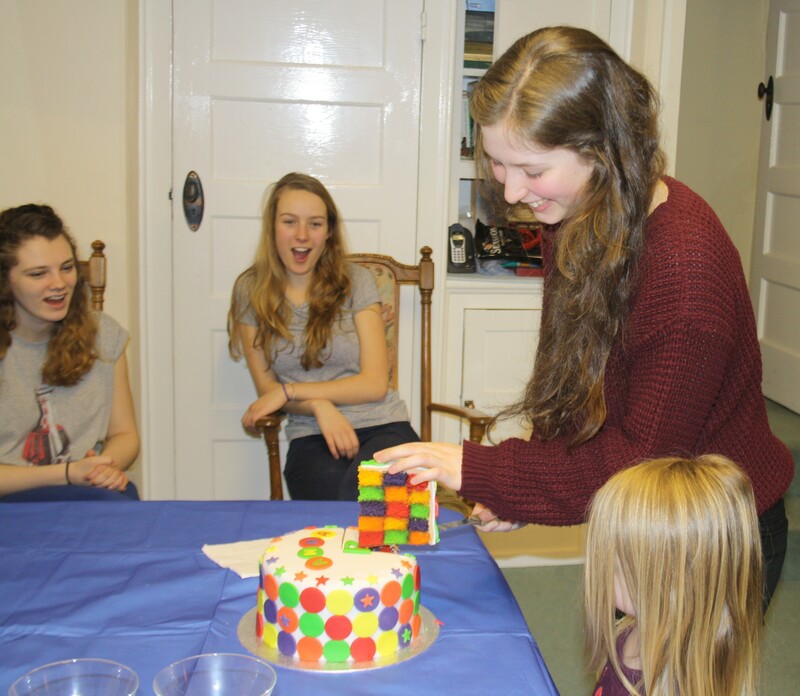 We decided the perfect alternative would be a rainbow checkerboard cake and Lizzy came up with the amazing idea of flavouring the cake with skittles to ramp it up a gear. Anna is an absolute sweet-fiend, she could easily eat a large bag of skittles in one sitting, so it seemed the perfect choice. 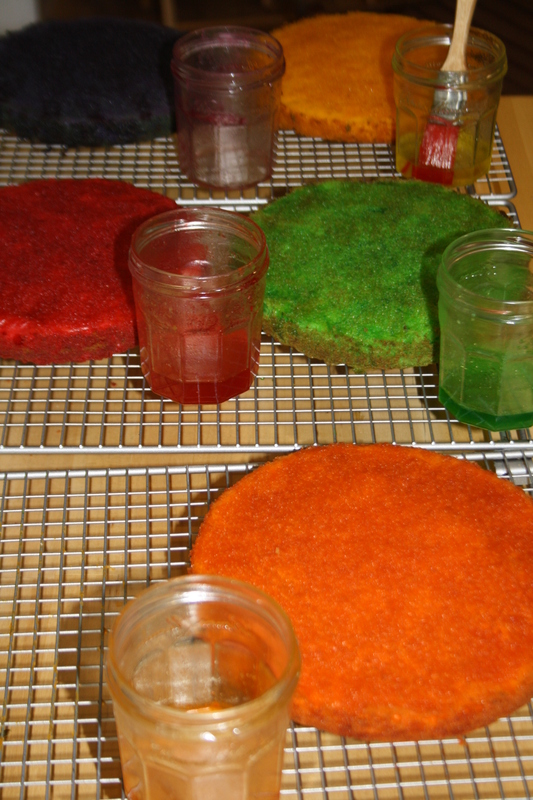 I also wanted each colour of cake to taste of that particular flavour of skittle (yes, you read that right). With that in mind, I am going to show you the process in photos, but with fairly vague ingredients/construction guide, as I worked a lot by eye. I can’t imagine that many of you will actually want to attempt this cake, (unless, like me, you are a bit baking bonkers!!) so I’m sure this will suffice! *Disclaimer* This cake is an absolute beast to make. Should you attempt it, I guarantee you will feel totally ‘skittled’ by the time it’s finished. I wouldn’t necessarily recommend trying it at home, unless you’re prepared to be in it for the long haul. If you do want to and have any questions, feel free to post them as comments at the end of the blog. 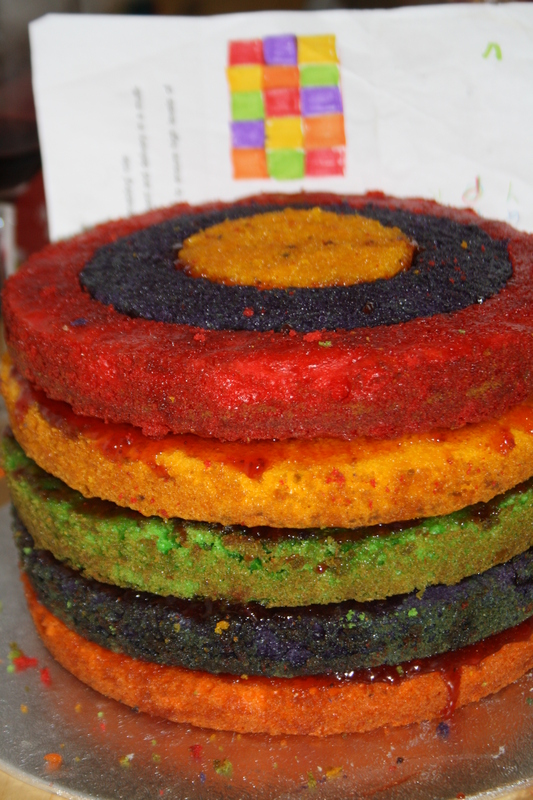 See instructions on my pastel rainbow cake post for how to colour your cakes. You will need just 5 cakes this time, as there are only 5 skittles colours. 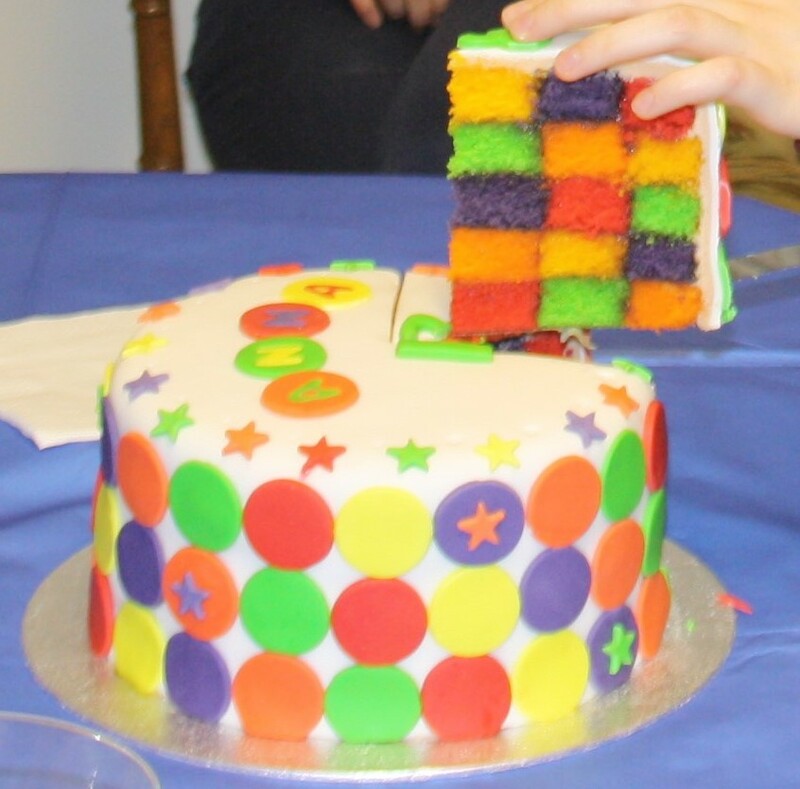 I used slightly more batter for this cake than the pastel rainbow cake above because I wanted to ensure that the squares would look properly square, as opposed to rectangular. 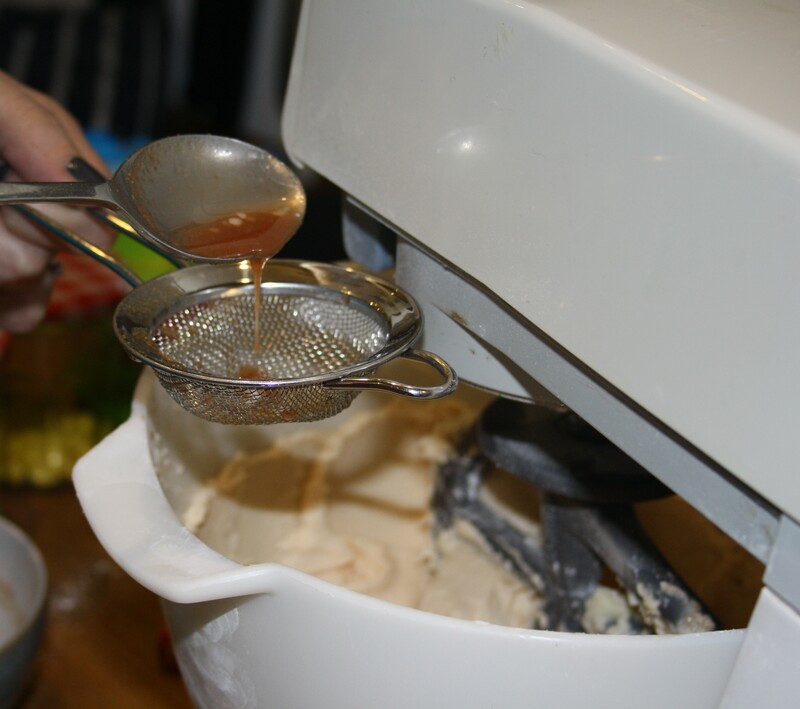 I quadrupled this basic 2 egg sponge recipe, using 8 eggs overall for the 5 cakes. I didn’t attempt to add skittles into the actual cake itself, as I didn’t have any way to grind the skittles finely enough and I didn’t want to ruin the texture of the sponge. 1. Melt insane quantities of skittles with water, to cover the skittles about half way (I think I used about 1 large bag, but I melted it in stages so I’m not absolutely sure how it would work if you tried to melt them all at once). Give it short blasts in the microwave and watch it like a hawk. Beware, the skittles syrup is extremely hot! 2. Cool melted skittles a bit, then add to your already-made buttercream (I made double the quantity of the basic buttercream, but only added 1 tsp of milk, as I was adding so much syrup). Add syrup SLOWLY, about a teaspoon at a time. I did this through a sieve, in case there were any bits of skittles shell that hadn’t melted, but actually, this didn’t seem necessary. 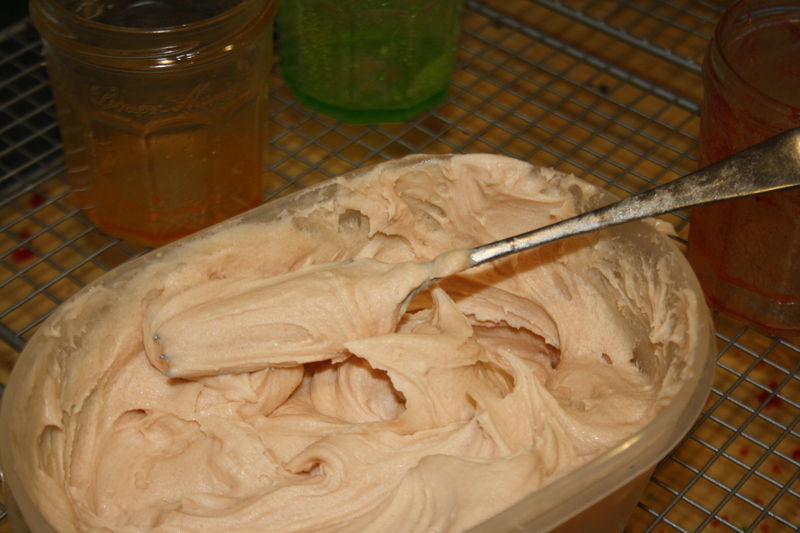 I had no idea how much of the melted skittles syrup I would be able to add, before the buttercream split, so I just kept going….and going…..and going. 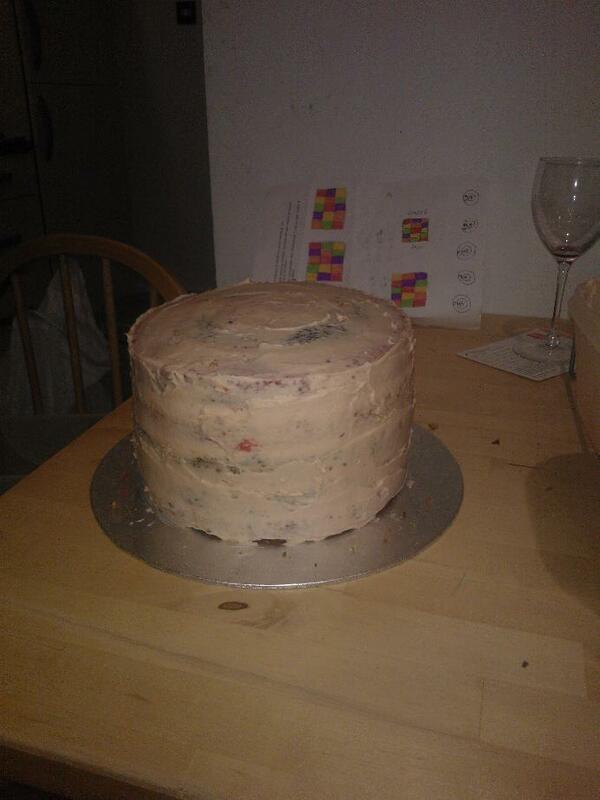 In the end, I added extreme quantities of melted skittles, so that the buttercream took on a strong skittles flavour. It didn’t curdle at any stage – perhaps because it’s literally just sugar that you’re adding, or perhaps because I added it sooooo slowly. It really did taste amazingly skittle-y by the time I’d finished with it! Melt even more skittles and add to a jar of strawberry jam. Melt the jam and skittles together a bit, but be careful not to let the jam burn. Leave in fridge to set. This was a real star of the show – a superb skittles flavour! 1. Separate remaining skittles and add a small amount of water. 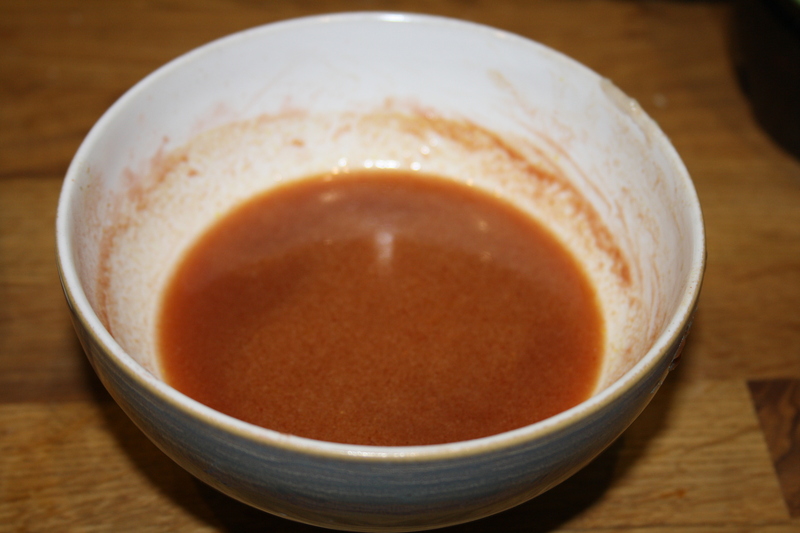 I left it overnight to dissolve, then turned it into a thicker syrup by blasting it in the microwave for a minute or so. 2. 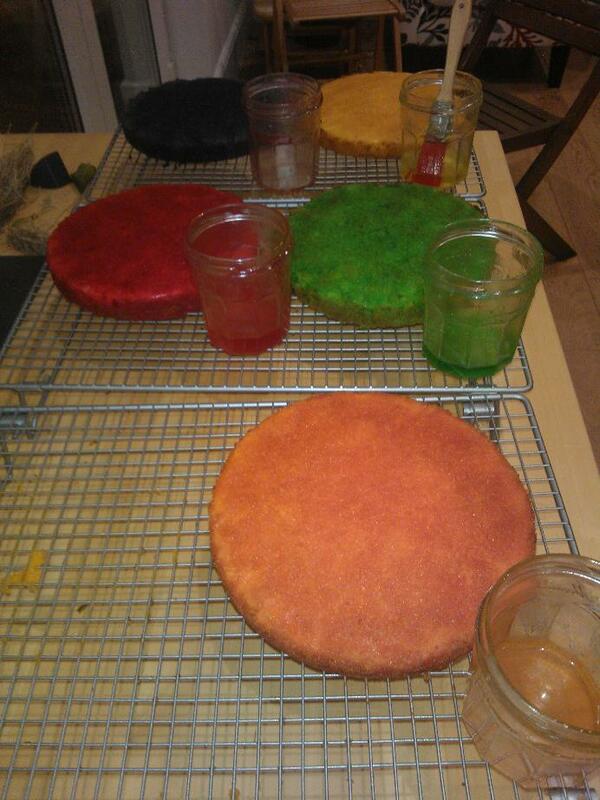 Drizzle skittles syrup liberally over the matching colour cake. 1. 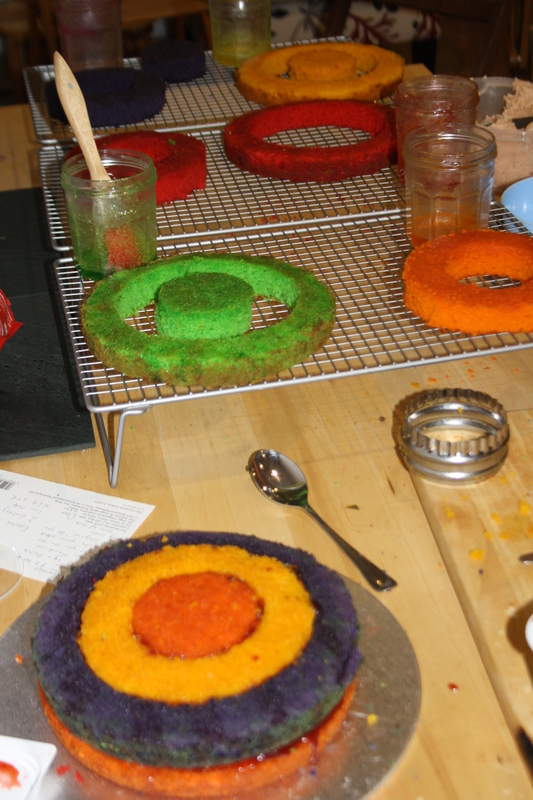 Cut rings out of cakes. I made 8 inch cakes, so I used 3 inch and 5 and 1/2 inch cutters to get the right size rings. For more instructions, look at Lizzy’s previous checkerboard post here. 2. Use skittles jam to stick the inside of the rings together. 3. 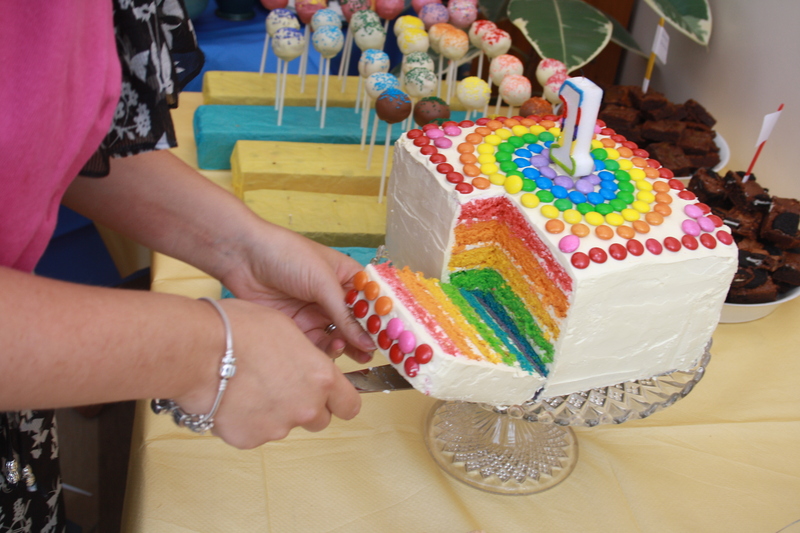 Put skittles jam between each layer as you build the cake up. 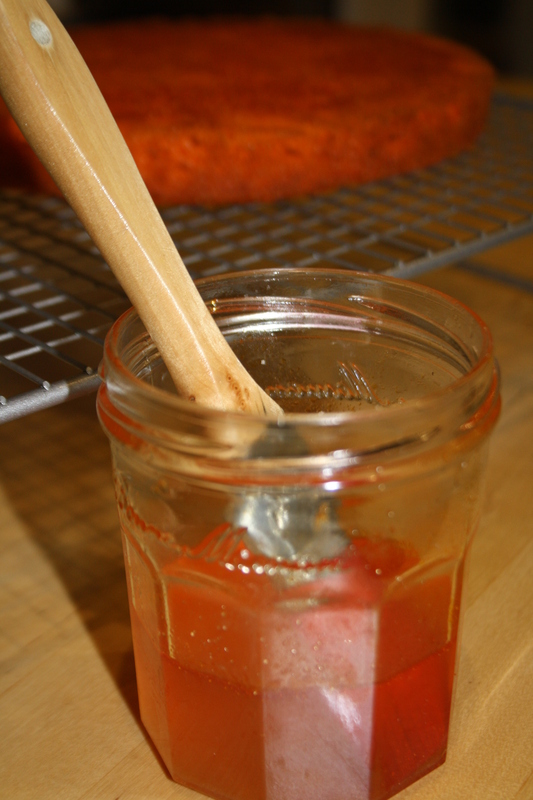 Make sure there is jam everywhere except the outside, or the squares will fall apart once sliced. Note: Stack the rings and layers according to the picture above (behind the cake), to make sure no colours are next to each other when you cut the cake open. 5. Decorate. 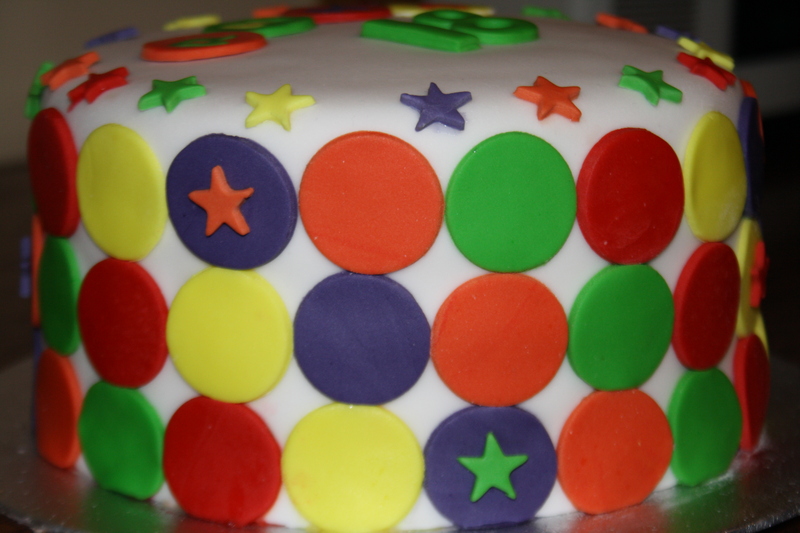 I put rolled fondant over the top as it was a special occasion, however I did feel that the icing took away from the skittles flavour a bit, so if I were to make this cake again I would just cover the whole thing in skittles. 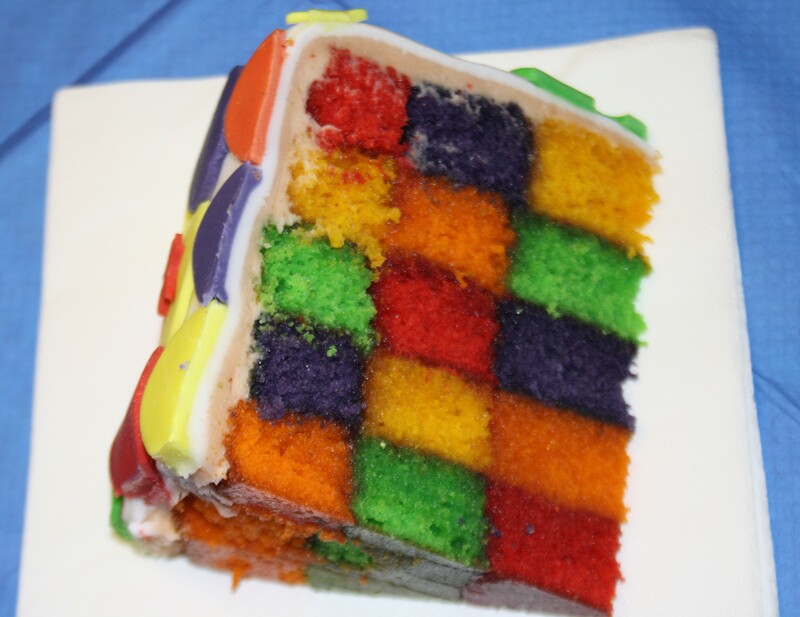 Rainbow checkerboard cake – the big reveal!! As you can see by the faces – it was definitely a surprise!!! Time for a little lie down now! Wow, what a lot of work but looks so absolutely amazing! Hope it tasted as fantastic too!